The Buck Stamps Here: Stamp Simply Celebrates! Isn't this just the most fun ever! :) Celebrating for sweet friend Sharon and her blogging milestone! Today I have the pleasure of participating in two challenges hosted by two of my favorite bloggers! First...Dee Jackson with a challenge to package up somethig edible. Second...Susan Roberts with a challenge to package up a gift card. 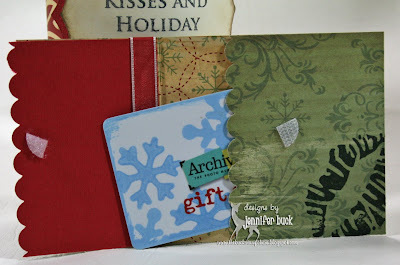 More blog candy from our sweet Sharon. Hope you enjoy todays events! We will all be back with more for you tomorrow! Don't forget that if you get a chance to play with any of the challenge you can upload them to either your blog and/or SCS under the keyword SSC08. LOVE the wine bottle label! Just beautiful! And with the gift card, what a great combo! The challenges and all this celebrating is great fun! Take good care! What a fantastic gift idea! 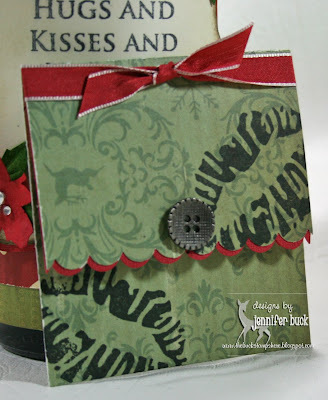 Your wine bottle looks SO festive and that card holder is awesome! This is MY kind of gift!!! Great job my friend!! Oh my gosh, Jenn, this is sooooo fabulous! You all are giving me so many wonderful ideas! Absolutely love this! Jennifer. what a great idea!! I love what you did with the wine bottle.. Fabulous. What a fantastic gift! I love this! Fabulous gift idea! Great choices all around!!! Very cool Jen! I love it all especially the wine! I LOVE this! That little gift card holder is awesome! Jacksonbelle New Years Challenge Number 2! A Holiday Hippity Hop And A Gift For One Of You! A Dirty Dozen Sneak Peek!